Shedding learnt practices can be difficult but few organisations have achieved it and here is what you need to know before adopting new organisational structures. The disruptions caused by technology is quite evident, but it is not the only thing that is continually evolving. As the war for talent increases, organizations are bracing themselves for the fight and shedding the traditional hierarchical structure of management to build a more agile work environment for the employees. Businesses today are more competitive and have a complex operative environment compared to any time in history. Today’s ‘exponential organizations’ are not only putting competitors out of business, but they are also entirely shutting off an entire industry overnight. Lean start-ups are moving with purpose, speed and agility to reshape markets and organization that still have been unable to let go of the densely layered, bureaucratic approach would not survive in the talent market and are considered as overly restrictive, inefficient, and an enemy of innovation. Companies like Haier, KalpTree Energy, and Airbnb have switched to alternative organizational structures of holacracy, flatarchy, and matrix organizations. These techniques give organizations and employees the agility to function and improve creativity. However, there are few challenges, and these structures come with their own set of obstacles. Employees have to embrace ownership; they need to think for themselves and forget what the other person will do if all responsibilities are handed over to them. The most crucial thing is understanding the changes are for the betterment of customers and employees together. Matrix management - This type of control has been in the industry since the 1970s. Employees have dual responsibilities and function and have more than one line of reporting manager. The structure provides a certain amount of flexibility and helps develop cross-functional roles. However, this structure is too complicated if not aligned properly and can increase complexity in the chain of command and conflicts amongst employees with regards to loyalty and it still follows a hierarchical approach. Holacracy - In an organization following the Holacracy approach there are is no hierarchy or bosses. Employees from a group also known as a 'circle' to achieve the final goal by following any method fit to deliver the results. In this structure it empowers the employees to take their own decisions and provides a great agile organizational structure. However, It can also create a sense of instability as everyone takes action as per their thought process which in return can create havoc and lead to impersonal interactions. Flatarchy - A structure that balances both hierarchy and flat organizational structure. It combines both types of structures making an organization flat yet creating an ad hoc hierarchy to work the end goals and achieve desired results. The only con of this structure is that the employees do not have permanent teams and employees can become isolated making it difficult to retain employees in the organization. 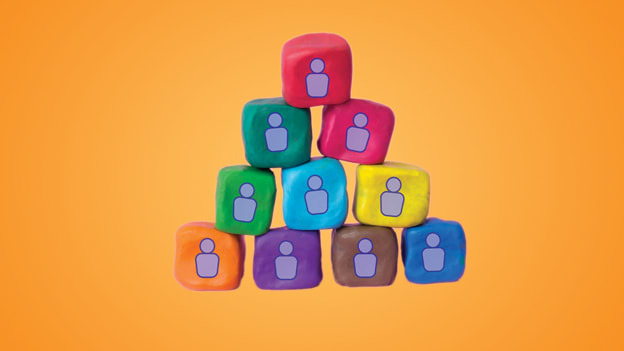 Traditional hierarchy- It is the classic top to down management system also known as the 'pyramid' approach. Although the method is quite structured and allows each with a given set of responsibilities, there are many loopholes in the system, and with employees demanding for more transparency, this structure can never succeed too well amongst millennials. Choose a structure based on its pros and cons as each system comes with its sets of benefits and downfalls. What an organization should understand is how ready they and their employees are to align themselves with the new arrangement. Find the areas in your organization that require agility and introduce new methods of functioning that can produce a better outcome. In short, Protect the core & disrupt at the edge. Create a new model of networked teams that is transparent, digitally aligned, scalable and adaptable. These teams have to be led by knowledgeable leaders who can provide cross-functional coaching and development, focusing on team dynamics to drive the desired outcomes. Genuinely agile companies have complex systems that require a holistic understanding of the connection between teams to be successful. Transformation should address the whole organization and adopt a systematic mindset that will enable building a nimble, flexible, team-centered organizational structure. Purpose, leadership talent, technology, and processes should power and support the networked teams. There is a need for a new leadership mindset who would motivate, guide and encourage teams to grow and succeed. The new workforce with the right nurturing and guidance will provide the right talent to scale up and achieve tremendous success.